(Nanowerk News) Even tiny gold nanoparticles, with a diameter of only 40 millionths of a millimeter, have something like a heartbeat. When focusing a short laser pulse on the particles they heat up very briefly and start to vibrate. But, even the best microscopes can not resolve these nanoparticles, which are therefore very difficult to study. Now assistant professor Markus Lippitz from the Max Planck Institute for Solid State Research, together with his Ph.D. student Thorsten Schumacher achieved a breakthrough that was published in the journal Nature Communications ("Nanoantenna-enhanced ultrafast nonlinear spectroscopy of a single gold nanoparticle"). He used a nano-antenna, which has already been applied successfully as a nanosensor by Prof. Harald Giessen from the 4 . Physics Institute of the University of Stuttgart. 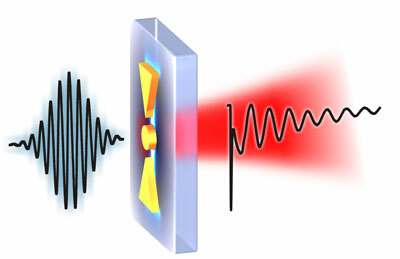 The principle of nanoantenna: The triangular nanoantennas focus the laser light on the small gold dot in the center, which starts to oscillate and to modulate the transmitted laser beam. By analyzing the oscillations scientists can learn a lot about the nano-gold: does it vibrate like a piece of steel, i.e., the volume is important, or does it rather vibrate like a balloon, i.e., the behavior is dominated by the surface. This exciting new research field is called nano-mechanics, and the Stuttgart assistant professor Markus Lippitz is one of its leaders. In his laboratory at the Max Planck Institute for Solid State Research we find a complicated experiment of lasers, mirrors and nanoparticles. This optical setup allows the researchers to watch the oscillations like using a strobe light. If a nanoparticle is sitting in a laser beam while swinging, the intensity of the laser beam is modulated slightly. Dr. Lippitz measures these fine oscillations with a special procedure developed by him. Lippitz' dream is to investigate the mechanical properties of the smallest nanoparticles. "The surface to volume ratio would then be huge, and we would expect new nanomechanical properties," he explains. To get one step closer to this dream, he placed a small antenna near the tiny particle. This nano-antenna focuses the laser light very tightly on the nanoparticle under examination. Consequently, the light modulation due to the nanomechanical vibrations are very efficiently coupled back into the laser beam. "This is the first time that someone uses nano-antennas to investigate ultrafast nonlinear optical effects. The whole thing works like a mobile phone, in which the antenna makes that the electromagnetic waves are effectively coupled into the small electronic circuits of the phone" Lippitz explains. Lippitz sees a huge potential for his new method: "In the future, we will be able to put the smallest nano-objects of a few nanometers in diameter in the focal point of a nano-antenna and study them using non-linear optical processes of only a few femtoseconds duration (1 femtosecond = 1 billionth of a millionth of a second take). Then we can make movies on the nanoscale, using the most extreme slow motion. Not only can we investigate nanoobjects such as semiconductor quantum dots, but also chemical and biological objects, such as molecules and viruses." The head of the 4th Physics Institute, Prof. Harald Giessen, added: "The work by Markus Lippitz is a results of the very successful collaboration between the Max Planck Institute and the University of Stuttgart. Markus Lippitz is an excellent young scientists, who also supports the Stuttgart Excellence Initiative in the Graduate School "Advanced Condensed Matter Science".